Tiger is gone. Maybe in more ways than one this year. But The Open Championship (aka the British Open) is still a compelling event to watch on TV. 59 year old Tom Watson in the lead. 49 year old Mark Calcavecchia right behind. I am not sure who I want to cheer for. Do I go for Watson because it would be an awesome story, or Cal for sentimental reasons (I caddied for Cal at the 1982 Westchester Classic. We missed the cut by a mile)? Of course anyone who only goes there for the beer deserves support! But back to the story of the day, the hour, the weekend. 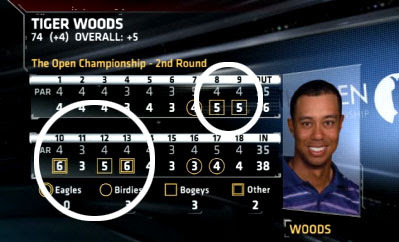 Tiger was 7 over in a stretch of 6 holes, the first time he has done that in his career. So enough talking. Here is the today's highlight video from ESPN.